Did a Cow Really Cause the Great Chicago Fire? Around 9 pm on Sunday, October 8, 1871, a fire started in a barn in the alley behind 137 DeKoven Street in Chicago. Two days later the blaze died out, after burning nearly three and a third square miles of the city. The Great Chicago Fire killed 300 people, left some 100,000 homeless, and destroyed $200 million worth of property. In all of American, and even world, history, no bovine is more infamous than a cow, belonging to Patrick and Catharine O’Leary, that was accused of starting what Fire Marshall Robert A. Williams called a "hurricane of fire and cinders.” Even as the fire cut a swath through the city, neighbors and newspaper reporters quickly placed the blame on the O’Learys and their cow. In the early hours of October 9, newspapers first reported that the blaze started when the cow, as Catharine milked it, kicked over a kerosene lantern. After the fire was put out, the story evolved and more blame fell on the O’Learys. Some papers reported that Mrs. O'Leary had been on welfare, and that when city officials discovered that she’d been selling her cows’ milk on the side, they cut her off. The fire, it was implied, was an act of revenge. Other newspapers maintained that the fire was an accident, and that a lantern had simply been knocked over, either by the cow or by Mrs. O’Leary. That November, the Board of Police and Fire Commissioners started an inquiry into the cause of, and response to, the fire. 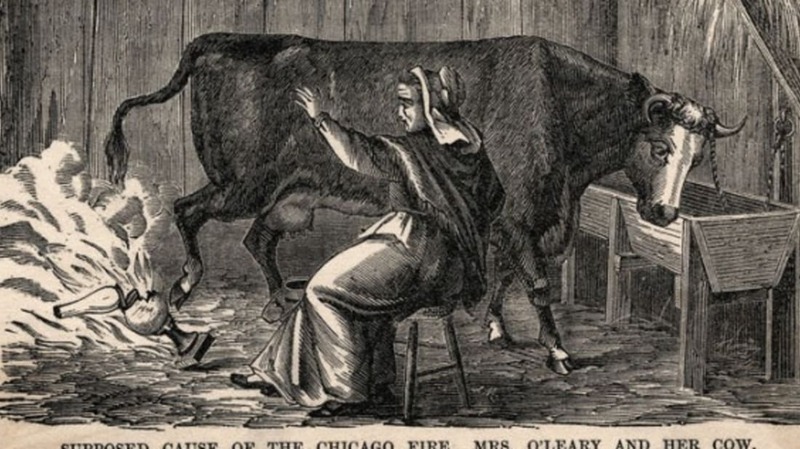 In interviews with the board, Mrs. O’Leary testified both that she never milked the cows in the evening and that she was asleep in bed when the fire started, having gone to bed early complaining of a sore foot. Daniel "Pegleg" Sullivan, a neighbor who was the first person to raise the alarm about the fire, also testified and confirmed Catharine’s alibi. After two months and 1100 pages of handwritten testimony, the board members couldn’t say much about the origin of the fire, except that it started in the barn. “Whether it originated from a spark blown from a chimney on that windy night or was set on fire by human agency,” they said, “we are unable to determine." Despite the board’s conclusions, or lack thereof, the damage to Catharine O’Leary and her cow were done. The story of the cow and the lantern circulated quickly and widely and took hold in the public imagination and the history books. Mrs. O'Leary lived out the rest of her life as a virtual recluse, reportedly only leaving her home to attend mass. Every October, reporters came to her looking for a quote for their fire anniversary stories and she shooed them away, invoking the name of her son James, who grew up to be a gambling boss known as “Big Jim” O'Leary. "I know bad people,” she’d say, as she showed the men the door. She died in 1895. Her obituary and death certificate listed the cause as acute pneumonia, but neighbors and friends said the real cause was a “broken heart” from the unfounded blame she received. A century after her death, Catharine and her cow were cleared of any wrongdoing, and another suspect was discovered. Richard Bales, an Assistant Regional Counsel with the Chicago Title Insurance Company, became interested in the fire when he wrote a paper about it for a college course. His company maintains the only set of land records that survived the blaze of 1871, and he used them to dig further into the legend of the O’Learys’ cow and the cause of the fire. In 1997, he published an article, and later a book, on his research. The cow also appears to be blameless, and several reporters came forward decades after the fire to admit that the story of the cow kicking the lantern was a fabrication, or at least came from unreliable sources. Reporter Michael Ahern, who was working for the Chicago Republican at the time of the fire, admitted in a 1921 column in the Chicago Tribune that he and two colleagues made the cow story up to add some color to their copy. After that, another reporter, John Kelley, wrote to the O’Learys' grandson saying that he was the one that wrote the first instance of the cow story under Ahern's byline, since his colleague’s drinking habit prevented him from writing and filing the story. Meanwhile, the Chicago Daily Journal explained that on the night of the fire, one of their reporters had gone to the O’Learys' neighborhood and heard the cow story from some neighbors there, and the paper ran with it without looking into it further. Recollections of the fire published by one of the O’Learys’ neighbors say that the story started with some neighborhood kids who hadn’t been in the barn or near it, but spent the night telling anyone who would listen about a cow kicking a lantern anyway. The most significant thing Bales found in his research was reason to suspect that the fire was started by "Peg Leg" Sullivan, the man who first noticed it. When he testified before the investigative board, Sullivan said that he visited the O’Leary house around 8 pm and found Catharine in bed and Patrick ready to join her. He headed home, but then kept going past his house and stopped in front of a neighbor’s house to smoke a pipe. He looked up and saw fire coming from the O’Learys' barn and ran into it to try to extinguish the flames and free the animals before seeking help. After mapping out the various homes and properties, Bales doubts Sullivan’s version of the events. First, the buildings were arranged in such a way that, from where he stood to smoke his pipe, Sullivan would not have been able to see the barn because another home would have blocked his view. What’s more, as one might guess from his nickname, Sullivan had a wooden leg, and couldn’t move very fast. Yet he claimed that he ran from his smoking spot to the barn—a distance about half the length of a football field—and escaped the barn before the fire consumed it, then ran to alert the O’Learys and the authorities. Given his condition, the distances involved, and the speed with which the fire spread, Bales argues, Sullivan could not have done what he claimed to without being injured by the fire. There’s also the matter of why Sullivan walked past his own house to smoke his pipe in front of his neighbor’s house. Bales thinks that was part of an alibi. Claiming to smoke his pipe where he did put him outside and close enough to the barn that he could claim to have seen the fire, but out of view of his neighbors, the McLaughlins, who were having a party that night and would have been able to see him if he was standing in front of his own house. Bales argues that Sullivan was in or around the barn that night—his mother kept one of her cows there and he may have gone to feed it—and, by accident with a careless flick of a match or a stray ember from his pipe or by bumping a lantern, started the fire. When he realized he couldn’t put the fire out on his own, he ran for help and came up with a cover story to escape blame. In 1997, convinced by Bales' argument and evidence, the Chicago City Council passed an ordinance exonerating Mrs. O'Leary and her cow.